The Munchkin's distinctive short legs developed from a spontaneous autosomal dominant mutation which has occurred several times in the domestic cat. Munchkins exhibit shortening and may have slight bowing of the long bones. 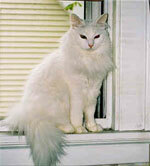 The spine is unaffected and similar in form and flexibility to that seen in other domestic cats. The short legs do not hamper mobility or survival ability. 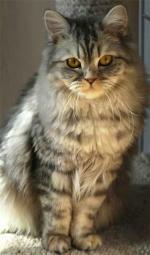 The breed has been established from spontaneously occurring domestic cat lines with augmentation by outcrosses to other domestic cats. Munchkins are outgoing, intelligent, and respond well to being handled. Excerpt from the Munchkin Breed Standard. 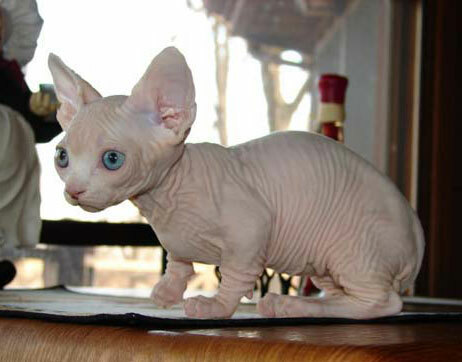 The Sphynx appears to be a hairless cat, although it is not truly hairless. The skin should have the texture of chamois. It may be covered with very fine down which is almost imperceptible to both the eye and the touch. On the ears, muzzle, tail, feet and scrotum, short, soft, fine hair is allowed. Lack of coat makes the cat quite warm to the touch. Whiskers and eyebrows may be present, either whole or broken, or may be totally absent. The cat should not be small or dainty. 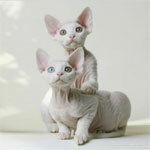 The Sphynx is sweet-tempered, lively, intelligent and above all amenable to handling. Medium-sized, modified wedge with rounded contours, slightly longer than wide. Skull is slightly rounded with a rather flat forehead and prominent cheekbones and a distinct whisker break. Large, rounded lemon shape. Slanting to outer corner of ear. Slightly more than an eye width between eyes. Very large, broad at base and open. Set upright, neither low set nor on top of the head. The interior is totally hairless. Slight amount of hair allowed on lower outside edges and on the back of the ear. Two planed, flat forehead. Slight stop. Muzzle and Chin: Strong rounded muzzle with distinct whisker break and firm chin. Slight to moderate stop at bridge of nose. Medium in length, rounded and well-muscled. The neck arches from the shoulders to the base of the skull and is powerful, especially in males. Medium in size, medium to medium long in length. The chest is broad, may tend toward barrel chested. The abdomen is wellrounded, having the appearance of having eaten a large meal, but not fat. Legs: Short with medium boning and firm musculature. Hind legs slightly longer than front allowed. Slight bowing in front legs allowed. Females may have slightly finer boning. Medium in size, oval shape with long, slender toes. The paw pads are thicker than in other breeds, giving the cat the appearance of walking on "air cushions". The toes are very long, slender and prominent. Tail: Whippy, tapering from body to tip (rat-tailed). Length is in proportion to body. A lion tail (puff of hair on tip) acceptable. Musculature: Hard and muscular, not delicate. Appears hairless. May be covered with short, fine down. May have puff of hair on tip of tail. Whiskers are sparse and short. Texture: Chamois-like. A feeling of resistance may be felt when stroking the skin of some cats. 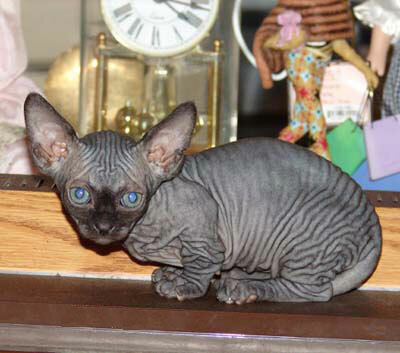 The skin is very wrinkled in kittens. Adults should retain as many wrinkles as possible, especially on the head, although wrinkling should not be so pronounced that it affects the cat's normal functions. 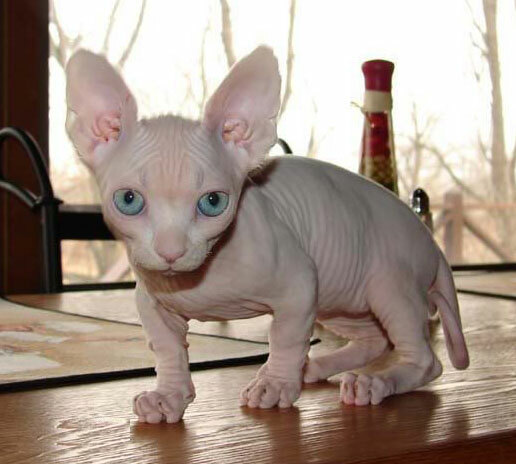 Bambinos are the deliberate hybrid of long-boned shortened dwarf cats, including the Munchkin and the extremely short-coated or hairless cats including the Sphynx, the desired results being a hairless, dwarf cat with an athletic appearance and a gentle but lively, outgoing and affectionate personality. 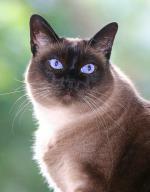 The standard Bambino would be a sturdy, muscular cat with a hairless appearance and a type distinct from other breeds. 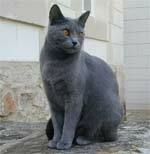 It is an intelligent, friendly cat that is agile as it's size does not hamper it's movements. 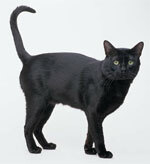 The Bambino responds well to being handled as they are very interactive, social cats. 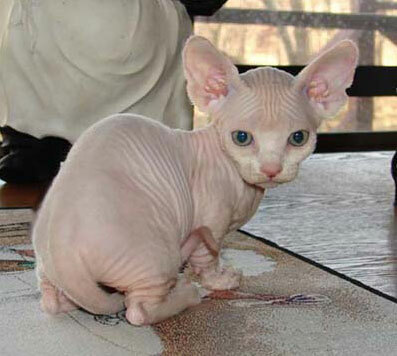 The Bambino appears to be a hairless cat, although it is not truly hairless. The skin should have the texture of chamois. It may be covered with very fine down which is almost imperceptible to both the eye and the touch. On the ears, muzzle, tail, feet and scrotum, short, soft, fine hair is allowed. Lack of coat makes the cat quite warm to the touch. Whiskers and eyebrows may be present, either whole or broken, or may be totally absent. The cat should not be small or dainty. Males may be up to 25 percent larger so long as proper proportions are maintained. The Bambino is sweet-tempered, lively, intelligent and above all amenable to handling. Overall small cat. Body that is too thin, frail-appearing or delicate or fine-boned; too cobby or foreign. Lack of wrinkles on the head. Straight profile, narrow head. Non-amenable disposition . Significant amounts of hair above the ankle. 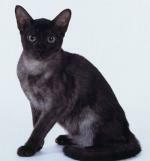 Any indication of wavy hair or suggestion of the Devon Rex, or Cornish Rex in molt. DISQUALIFY (DQ): Any evidence of depilitating, plucking, shaving or clipping or any other means of hair removal. Inability to handle.